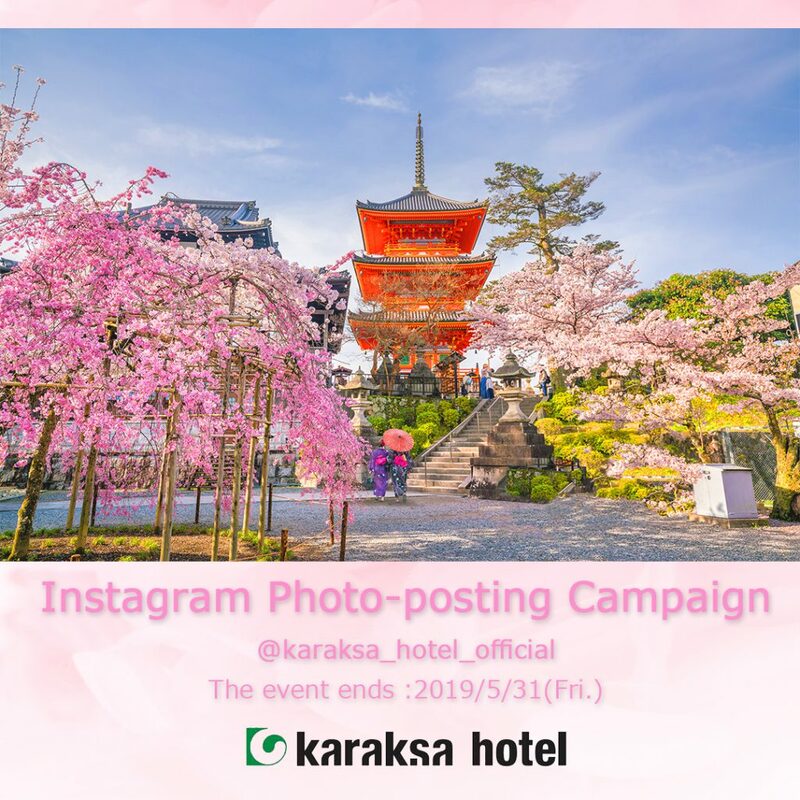 To celebrate the opening of “karaksa hotel premier Tokyo Ginza” on May 1,2019, we are having a time-limited spring’s photo-posting promotion on the official account of “karaksa hotel”! 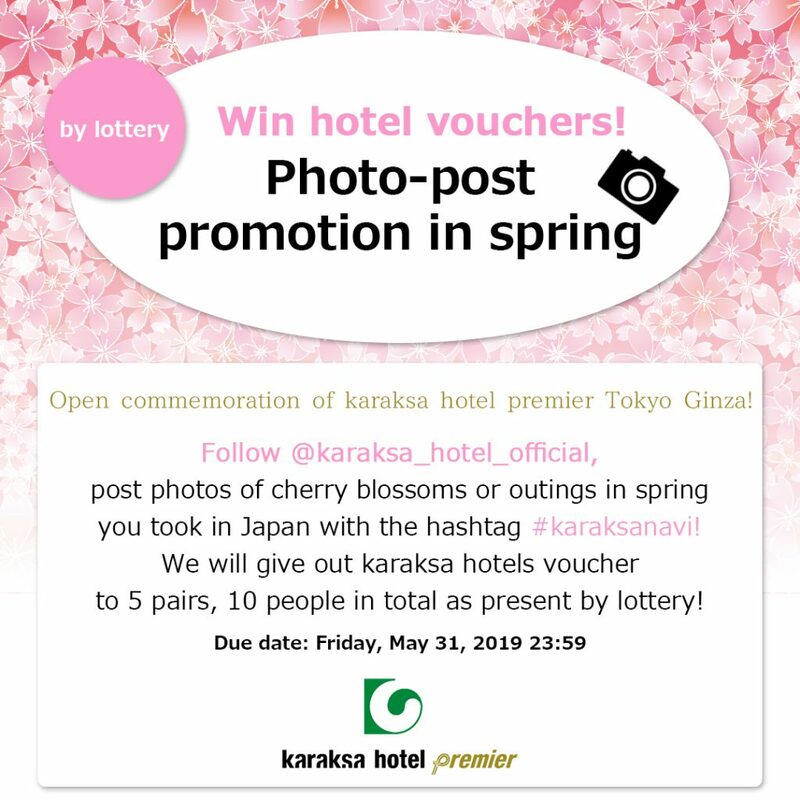 Please post photos of cherry blossoms or tourist spots in Japan with the hashtag 【#karaksanavi 】! Any photos about Japan’s spring would be fine, such as photos of cherry blossoms in full bloom, or photos of tourist spots in Japan in spring. We will give out hotel vouchers as present to 5 pairs, 10 people in total by lottery. You can use the vouchers in karaksa hotels all over Japan, including karaksa hotel premier Tokyo Ginza. Moreover, we might introduce nice photos you post on this account, karaksa hotel official website or official accounts on other social media. *Introducing photos on this account is not the announcement of winning, please be noticed. Step 3: Five winners selected through lottery will receive accommodation vouchers! karaksa hotels holds no responsibility for posted photographs that infringe upon the likeness and other rights of a third party. It is considered that the consent of anyone depicted in photographs has been obtained by the person posting the photographs. Photographs on private accounts or those without the campaign hashtag will not be considered. Campaign winners will be contacted via direct messaging on Instagram from the karaksa hotel official account, “@karaksa_hotel_official.” The campaign winners are scheduled to be announced in late June. This is the official Instagram account for the popular karaksa hotels, who provide a full range of services for domestic and international travelers. We post your beautiful photos of souvenirs and sightseeing spots from Sapporo, Tokyo, Osaka and Kyoto where you can find our hotels. Please use #karaksanavi on your posts, and your photos might appear on our Instagram account!